When we started the project, the venue hadn’t been named—a process we were actively involved in. (Mockingbird was the result of a discussion started by the proprietor suggesting Atticus, the protagonist of his favorite novel.) 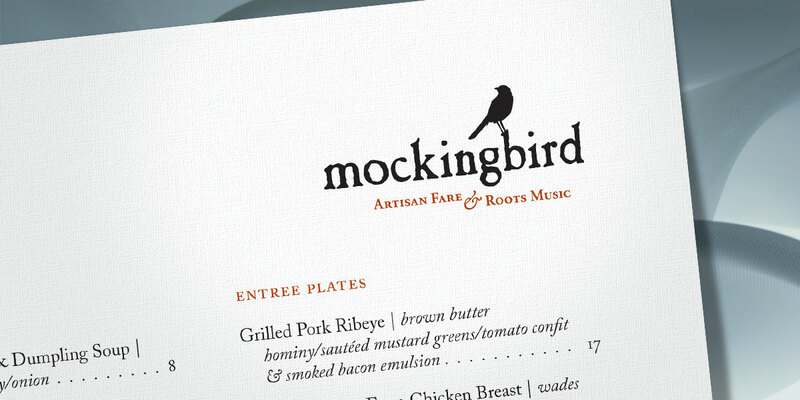 We created the logo to reflect the hand-crafted elegance of the local food and roots music. After considering one approach of designing two separate, but related logos (one for the restaurant and another for the music hall) we decided to unify the brand identity as most patrons take advantage of both of the establishment’s fine offerings.